Just as in the January Million Women March, women came together all over the planet this past week for “International Women’s Day” rallies. 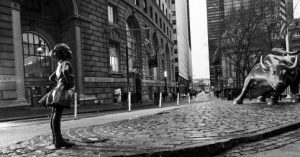 One of my favorite moments was the unveiling of the newly installed “Fearless Girl” statue facing the bronze Wall Street Bull. The story behind it is wonderful as well. This is about hope, my blogs theme. The “Bull” has stood for decades representing “America’s” strength. 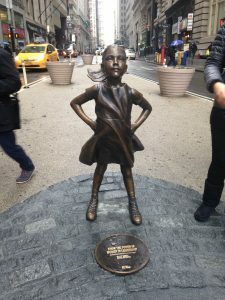 From Vox.com, the Boston-based State Street Global Advisors (SSGA) commissioned the statue from artist Kristen Visbal for International Women’s Day to call on companies around the world to address gender inequality and the gender pay gap. The company said that one in four of the 3,000 largest traded US companies don’t have a single woman on their board. Among other things, though, gender equality is at the core. 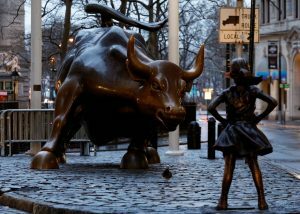 One image I adored was of a young girl, same size, standing alongside, eyeing the Bull, also, fearlessly. I have included the link which includes interviews of young visitors who perfectly expressed their reactions. 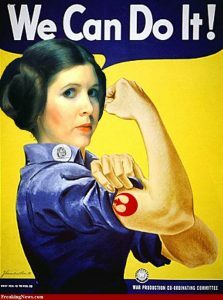 Of course, my Dorothy, as in Princess Leia, was in every crowd. The resistance is alive and well. Out of the darkness comes the hope of the future. Do you have anything to share about International Women’s Day? Did it inspire hope? I simply want to say I am beginner to blogging and seriously savored your web-site. More than likely I’m going to bookmark your website . You really come with exceptional article content. With thanks for sharing with us your webpage. I simply want to mention I am just beginner to blogging and site-building and definitely liked your web-site. Probably I’m planning to bookmark your site . You actually have tremendous articles. Thanks a bunch for revealing your blog. Thanks for any other informative web site. The place else may I am getting that kind of information written in such an ideal way? I’ve a venture that I’m simply now running on, and I’ve been on the look out for such information. Thank you, I’ve just been searching for information about this subject for a long time and yours is the greatest I have came upon till now. But, what about the conclusion? Are you certain in regards to the source? It’s the best time to make some plans for the future and it’s time to be happy. I have read this post and if I could I wish to suggest you few interesting things or suggestions. Perhaps you can write next articles referring to this article. I desire to read more things about it! Can I simply say what a relief to find somebody that truly knows what they are talking about on the web. You certainly realize how to bring an issue to light and make it important. A lot more people have to look at this and understand this side of your story. It’s surprising you are not more popular because you surely have the gift. hello!,I like your writing very a lot! percentage we keep in touch extra about your article on AOL? I need an expert on this space to solve my problem. Maybe that is you! Having a look ahead to see you. It¡¦s in point of fact a great and helpful piece of information. I am satisfied that you simply shared this useful information with us. Please keep us informed like this. Thanks for sharing. Helpful info. Lucky me I found your web site by chance, and I am stunned why this twist of fate didn’t happened in advance! I bookmarked it. I am now not sure where you’re getting your information, however great topic. I needs to spend a while studying more or understanding more. Thanks for magnificent info I used to be in search of this information for my mission. I precisely needed to say thanks yet again. I’m not certain the things I would have tried in the absence of the entire points shown by you relating to such field. It was before a very challenging setting for me personally, but viewing a skilled mode you solved that made me to leap for gladness. I’m happier for this help and in addition trust you comprehend what an amazing job that you’re doing educating other individuals through the use of your webpage. I am sure you have never come across all of us. Hey There. I discovered your blog using msn. This is an extremely neatly written article. I will make sure to bookmark it and return to read extra of your useful information. Thank you for the post. I’ll definitely comeback. Hello here, just got aware of your blog site through Search engines like google, and discovered that it’s truly interesting. I will truly appreciate should you carry on this approach. I view something really interesting about your website so I saved to bookmarks . Hi there, just started to be familiar with your wordpress bog through Google, and found that it’s pretty informational. I’ll take pleasure in if you keep up this idea. Greetings there, just started to be receptive to your writings through Yahoo and bing, and discovered that it’s seriously entertaining. I will take pleasure in if you decide to maintain this idea. I do accept as true with all of the concepts you’ve introduced for your post. They are really convincing and can definitely work. Nonetheless, the posts are very short for beginners. May you please extend them a little from subsequent time? Thanks for the post. I really like your writing style, fantastic info, thanks for posting :D. “Your central self is totally untouched By grief, confusion, desperation.” by Vernon Howard. Good day very cool web site!! Guy .. Excellent .. Amazing .. I will bookmark your site and take the feeds also…I’m glad to search out a lot of helpful info here within the submit, we’d like work out extra strategies on this regard, thanks for sharing. Nice read, I just passed this onto a friend who was doing a little research on that. And he actually bought me lunch since I found it for him smile Thus let me rephrase that: Thank you for lunch! “Any man would be forsworn to gain a kingdom.” by Roger Zelazny. Some really excellent information, Sword lily I observed this. “Desire creates the power.” by Raymond Holliwell. I went over this internet site and I believe you have a lot of good information, bookmarked (:. F*ckin’ remarkable things here. I am very happy to peer your article. Thanks so much and i am taking a look forward to contact you. Will you please drop me a e-mail? What i do not understood is in reality how you are now not really a lot more neatly-preferred than you might be right now. You’re very intelligent. You already know therefore significantly relating to this topic, produced me for my part consider it from numerous varied angles. Its like women and men are not involved unless it’s one thing to accomplish with Lady gaga! Your own stuffs great. At all times handle it up! Someone essentially assist to make severely posts I’d state. That is the very first time I frequented your website page and so far? I amazed with the analysis you made to make this particular post incredible. Wonderful task! Normally I don’t read article on blogs, but I would like to say that this write-up very compelled me to take a look at and do it! Your writing taste has been surprised me. Thank you, quite great post. I loved as much as you will receive carried out right here. The sketch is attractive, your authored material stylish. nonetheless, you command get got an nervousness over that you wish be delivering the following. unwell unquestionably come more formerly again as exactly the same nearly very often inside case you shield this hike. magnificent put up, very informative. I ponder why the other experts of this sector do not notice this. You must proceed your writing. I’m confident, you have a great readers’ base already! Thank you for the sensible critique. Me and my neighbor were just preparing to do a little research on this. We got a grab a book from our area library but I think I learned more clear from this post. I’m very glad to see such excellent info being shared freely out there.